Let’s break Speedify into pieces to see what is inside. Speedify is a new entrant in the VPN industry and offers a reliable, fast and versatile VPN service. It works with various streaming services as well. The downsides of Speedify are that it doesn’t have a live chat feature which makes its customer support a bit lackluster and the company keeps some logs on its customers which is never a good sign for a new VPN service provider. Speedify is a VPN service that operates out of Philadelphia. But it comes with enough twists to be considered as anything but an ordinary VPN service. Initially, Speedify started off as a service that users could sign up for if they wanted a speed boost. Slowly, the service managed to morph into a full-fledged VPN service after the company operating the service added encryption back in the year 2016. Now, Speedify is much more than a speed-boosting online service. It is a service that can encrypt user data with ease. Speedify can also mask the user’s IP address. Along with that, it makes use of a combination of several internet connections in order to offer a faster and reliable super internet connection. at really fast speeds without facing any connection issues. Our review will see if this Speedify service can rub shoulders with some of the best VPN services in the world right now. The company makes a lot of claims about how good it is and the unique features it offers, so it is very important to test it thoroughly to check the veracity of those claims. As a VPN service, Speedify has a multiple number of subscription packages for potential customers. The first of these packages is called the Starter Plan. This plan is completely free. You don’t have to pay anything to use Speedify via the Starter Plan. This plan comes with a few restrictions though. 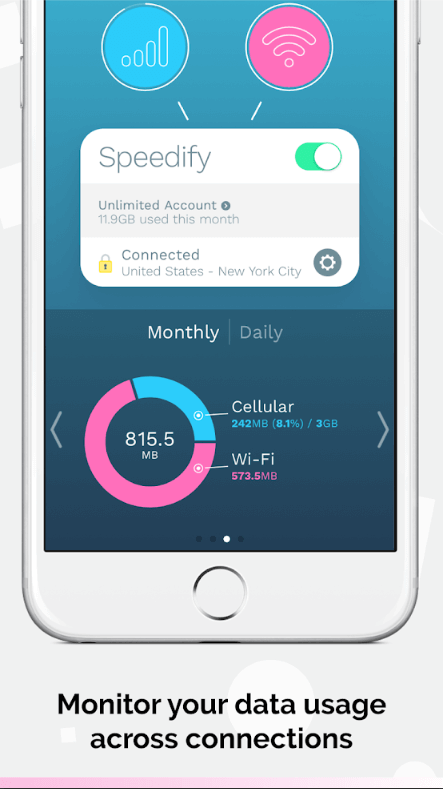 Firstly, users are limited to only 1GB of data per month. Apart from that, users may only protect one device via the Speedify Starter Plan at any given time. In other words, the number of simultaneous connections allowed is just one. We are fully aware of the fact that the starter plan simply would not cut it for most online users. But the thing is, Speedify allows users to consume its Starter Plan without having to go through a registration process. The more privacy-conscious of our users should take advantage of this opportunity to check out the service without giving up any of their information. This Starter Plan should also sound like a winner to those users who always want a free trial before they actually sign up with a given VPN service. Remember, even though there are some restrictions, Speedify does offer some perks with the Starter Plan in the sense that users get to have complete access to the company’s server network which consists of many servers in strategic locations around the world. This is something we haven’t seen too many VPN services do with their free plans. Users who want to connect up to a total of five simultaneous devices and unlock an unlimited amount of data can do so with the help of a paid package. Speedify calls its first paid package as the Individuals plan. Users can subscribe to this package on an annual or monthly basis. Sometimes there are discount offers as much as 75 percent. If you are one of those readers then expect to pay up to $50.00 per year for Speedify’s annual plan. On a monthly basis, this cost turns out to be around $4.17 per month. Users who want to take advantage of dedicated VPN server can do so by paying Speedify an additional $120 every single month. Some of our readers who have had some experience with VPN services would know that Speedify’s subscription packages (annual and monthly) cost about the industry’s average. With that said, we know of many VPN service providers who offer even longer subscription periods and even steeper price discounts. The Team subscription plan gives users about the same VPN features as Speedify’s individual plan. Additionally though, it offers functionality that is precisely tailored to businesses. All of Speedify paid plans come with an official (and rather generous) 30-day no-questions-asked money-back guarantee. As far as the VPN industry goes, this list is pretty limited. Good VPN service providers offer users plenty of payment methods so they don’t have to worry about these things. Having a limited array of payment options does nothing for a VPN service other than to push potential customers away. Moreover, there is a new breed of privacy-conscious online consumers who are only comfortable in paying for a VPN service via cryptocurrencies such as Bitcoin. Since Speedify doesn’t have cryptocurrencies as a payment option, it is highly likely that chunk of users would stay away from Speedify. Yes, Speedify does not support Linux. And no, you can’t run Speedify even through manual configuration. There are several good VPN services that provide router support in the sense that users can install the VPN service right onto a WiFi router. This enables the user to protect as many devices as possible. On a side note, Connectify is Speedify’s parent company. Connectify started out its own business by providing users with a service that helped them to transform their desktop machines to WiFi hotspots. In that context, Speedify doesn’t do anything out of the ordinary when it tries to plug in the Connectify service. Speedify recommends that users should purchase the service in place of trying for hours and hours without any success at configuring a VPN service with their WiFi router. We’re not saying that Connectify isn’t a viable option. But the thing is the eventual money the user has to part ways with at the end of the month. 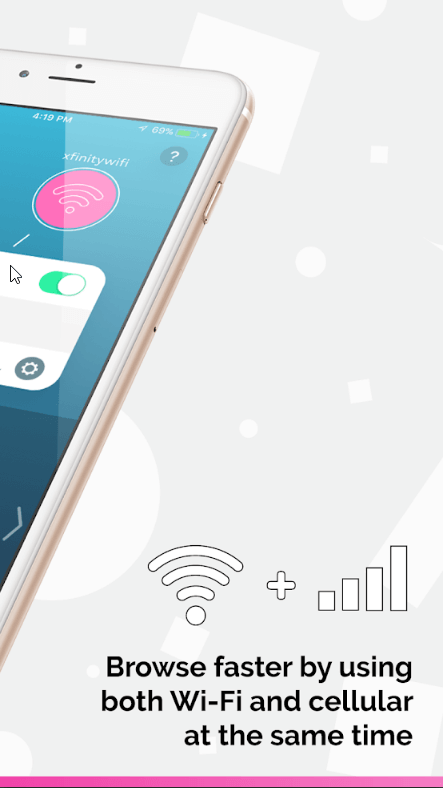 With Connectify, the user will not only have to pay for a VPN service but also for a WiFi-conversion service. There are several VPN service providers that offer users router configuration along with the capability of creating a virtual WiFi hotspot of their own. But they do all of it while staying within their basic VPN subscription package offerings. In other words, we don’t know how many users would be willing to put up with a Speedify and Connectify combo when they know that there are better and more economical packages available. Each Speedify subscription plan comes with complete access to the company’s VPN network of 1000 plus servers. These servers are neatly spread out in over 32 countries. Speedify offers numerous security features. 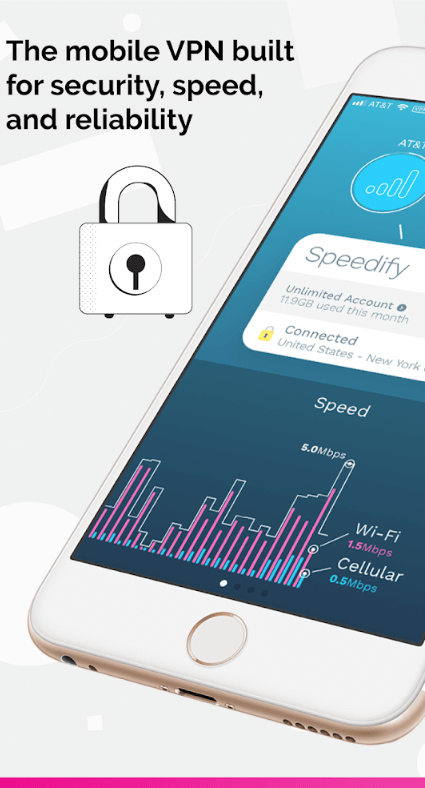 Since Speedify offers unlimited data usage and backs that up with above-average speeds, it makes sense that the company also offers users many torrent-enabled VPN servers. Users looking for a VPN service that allows them secure and fast downloads should give Speedify a try, at the very least. Speedify also happens to have a channel bonding option. This is the feature that we think differentiates Speedify from the rest of its competitors. The majority of the VPN services on the market only work with one internet connection. This is pretty similar to a device that only makes use of a single internet connection at any given time. On the other hand, Speedify VPN service has the capability to combine more than one internet connections at any single moment. Well, it makes use of a proprietary protocol. Using that, it is able to utilize multiple adapters and interfaces at the same time. To take an example, let’s say a user at home wanted to combine one Ethernet connection with a WiFi connection. Speedify can make that happen. Another example would be if a user wanted to combine a WiFi connection and cellular connection on his/her mobile device. 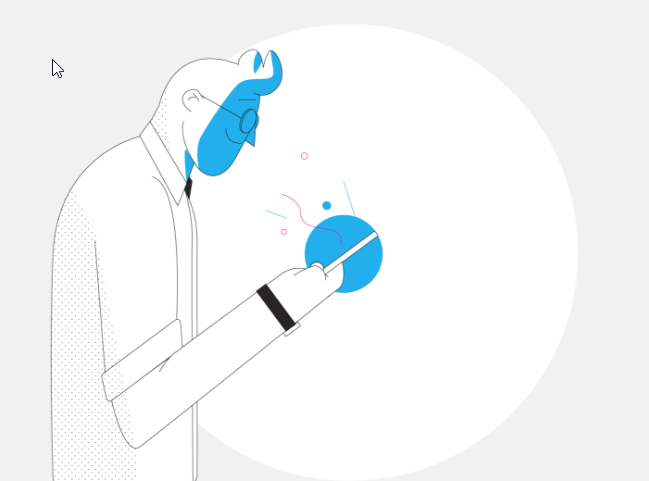 Speedify has the measures in place to detect the individual capabilities of each and every connection. Then it uses some good old intelligence and distributes the user’s traffic in such a manner that the user is able to get around 95 percent of the total efficiency of the combined internet connections’ throughput. No prizes for guessing that the company behind this feature feels very strongly about its potential. According to what Speedify is trying to sell users, users should get two huge benefits out of the channel bonding feature. The first of these benefits is improved speed. Well, as mentioned before as well, Speedify can combine the individual speeds of multiple given channels in order to create a super connection which is faster than both its constituent internet connections. We went out in the wild and researched how good this feature is. Read the upcoming sections to find out our conclusions regarding this channel bonding feature’s effectiveness. The second benefit that users should supposedly get out of this feature is an enhanced reliability. If the connection bonding feature detects that one of the user’s internet connection has dropped, it will make sure that it keeps the other one intact. Consequently, there is little to no disruption to the user’s streaming, browsing or any other activity that the user might happen to have engaged himself/herself in while the connection dropped. The installation process for Speedify (as is the case with the majority of VPN service providers today) is a pretty straightforward task. Users who are trying out the company’s free Starter Plan have it great because they don’t even have to give any information to Speedify in order to start using the company’s service. All that these free users have to do is to download and then launch the official application. After that, it is just a matter of connecting and going. Let’s come to the paid plan now. For the paid plan, users have to provide the company with the necessary payment details. Speedify also requires paid users to provide their email addresses. After that, users should expect to receive a multiple number of welcome emails from Speedify. Needless to say, one of these email messages would contain a link. Users can open that link in order to set up their account’s password. In this Speedify review, we will talk about the Speedify Windows VPN client and the company’s mobile VPN app for the iOS platform. Once the user has managed to download the official app and then has run software application’s setup file, he/she is free to launch the Speedify application and enter his/her login credentials. After the user has done that, the official app will greet the user with the main screen of Speedify Windows application. The user interface is easy to navigate and practical. But we can name quite a few VPN service providers whose user interface is sleeker than that of Speedify. Let’s talk about the Windows client’s user interface. On the main screen, users can see their connection type and name right at the top. 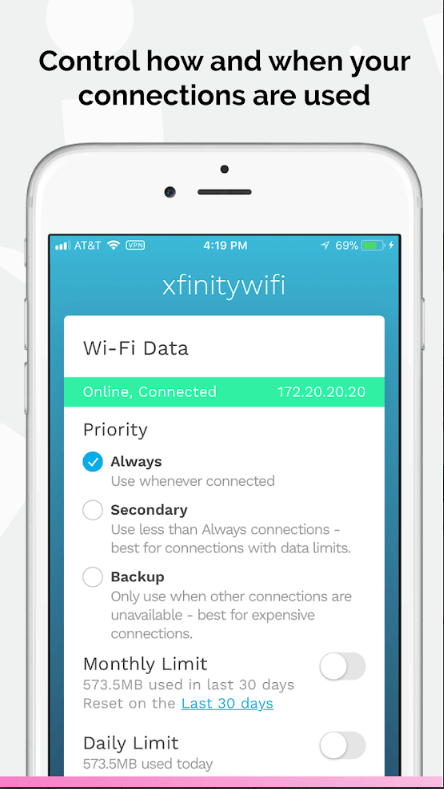 It should not be hard for users to figure out the way they can see their current WiFi connection and the Speedify proprietary feature where users can add another internet connection to the current one. Users who have a multiple number of internet connections at home can combine them. As mentioned above, an example could be where the user combines the ethernet connection with a wifi connection in order to get a faster internet connection. Apart from that, users have the option of viewing whether they have connected to a given server or not. The main screen also shows the amount of data that they have used. Additionally, the main screen lets the user know which server the user has connected to at any given moment in time. Such a feature is pretty handy if the user wants to determine the net effect of combining multiple internet connections. There is also a slider in place which takes the user to another page that shows additional information on the user’s daily and monthly data usage. One other thing users need to know about the multiple connections feature is that it doesn’t matter if the user is on the mobile or the desktop app, the user still has the option of accessing settings belonging to each internet connection. All that the user has to do in order to see the settings is to click on the internet connection’s relevant circle. Fundamentally speaking, the user gets to choose how and when Speedify should use each of his/her internet connection. We can sympathize with that. Internet service providers all over the world are notorious for applying steep charges for overages. So, users should try their level best to avoid consuming valuable data via wasteful activities.Let’s talk a bit more about the Speedify desktop app main screen. If we turn our attention to the middle of the main screen, we should be able to see a gear icon. This icon is present in the right corner of where the screen shows the user server locations. Users can perform a click on this gear icon in order to change other VPN settings. Talking about the Settings menu, the first screen that users see when entering the Settings menu is the Servers screen. There is where users can modify their VPN server location based either on city or country. Users who want to access all the city options should perform a click on the arrow that appears right next to the country name. Doing so will open up a drop-down menu for further options. There is an alternate way, however. Users can select the fastest VPN server on the basis of their real location. As mentioned before as well, Speedify also offers users torrent-enabled VPN servers that specifically cater to heavy downloaders. If users choose the torrent-friendly VPN server option then the Speedify app would proceed to direct the user towards those VPN servers that support P2P protocols such as BitTorrent. Just below the Servers screen, the official Speedify app has the Sessions tab. This Sessions screen comes with its own set of options for users. The first of these options is the option labeled Connect at Startup. This option simply coerces the operating system to make a connection to the internet with Speedify each and every time the user starts up his/her machine or mobile device. After that, we have another option labeled Redundant Mode. This mode has the ability to send the user’s traffic across all of the pre-configured internet connections. Such a mode ensures the optimal amount of reliability. Now we come to the Transport Mode option. Users can take advantage of such options to make the decision of which of the available tunnel protocols they would like the Speedify app to use first. Of course, users can just leave this option alone and let the VPN client make that decision for them. Speedify app supports both UDP and TCP Transport Mode network protocols. The final tab is the Privacy tab. This is the tab that houses different kinds of privacy and security options. When users click on the tab, the app will ask them to select a region for themselves. Our research shows that Speedify did not come with this feature before. It is a completely new feature. We can only surmise that Speedify introduced this option in order to comply with the new GDPR requirement. As far as the options themselves go, they remain pretty much the same for each and every available region apart from Europe. Users who select Europe as their region will not have the opportunity to use the Data Optimization toggle. Apparently, the Data Optimization option has something that goes against the new GDPR rule and hence Speedify judged it not suitable for European users. A little bit below the region selection option, the Speedify offers users the DNS leak protection feature along with the Internet Kill Switch feature. The thing readers need to note here is that Speedify disables both of these features by default. It is difficult to understand the reason for doing so. Encrypted, is another option that is on the table as far as the Privacy tab is concerned. As the name of the option suggests, this option deals with the Speedify app using or not using Encryption. That is very odd, especially for a VPN service. But then again, Speedify doesn’t really market itself as the most secure VPN service on the planet. It promotes itself as a channel bonding online service rather than a full fledged VPN service. There is little doubt about the fact that if users deactivate the encryption feature, it should speed up their internet connection a little bit. But if users do go ahead with such an option then Speedify would no longer secure their connection with encryption. That basically defeats the whole point of using a VPN service, to begin with. Another option that lurks just below the Encrypted option is the Data Optimization option. 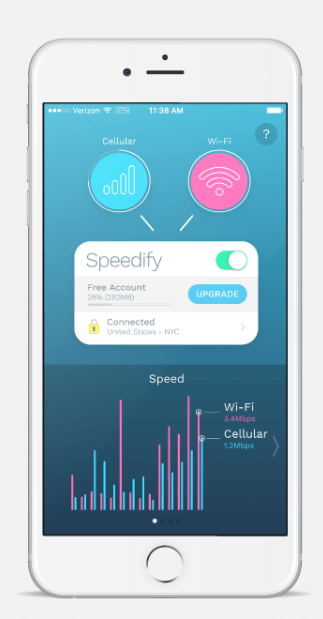 As mentioned before, when users enable this option, it enables the Speedify app to collect various network statistics in order to fine-tune the connection’s performance. Speedify doesn’t go into the details of what type of statistics they actually collect and record. As far as security and privacy go, we recommend that users should definitely disable this option. Or opt out of it, in other words. The final option is the Crash Reports option. This option simply allows the official Speedify app to receive various kinds of information related to debugging whenever a user experiences a crash. Speedify mobile app asks the users for their region the first time they download and run it. The document details what type of information does Speedify collect and doesn’t collect. We’ll talk more about what Speedify tracks and records in later sections of this review. When the user eventually gets past the first screen, Speedify mobile app finally shows the app’s main screen. It shouldn’t be hard for users to notice that both the desktop app and mobile app main screen look alike. The mobile app’s main screen displays internet connections right at the top of the screen. Users have the option of clicking each shown circle in order to remove a given connection and/or change the given connection’s settings. Those mobile app users who want to access the app’s Settings menu should just click the shown gear icon that appears right next to the VPN server location (which is itself located right in the middle of the main screen). Just like the desktop version Settings menu, the mobile Settings menu also shows users several different options. The first of these options is Servers. As mentioned just now, this is also an option that the desktop client offers as its first screen. Mobile app users have the facility to switch their VPN servers on the basis of location, P2P capability, and speed. The next section is the Session section. This is where users can modify their startup internet connections. The Session section also offers options such as the Redundant Mode and the Transport Mode (options for changing the settings for both these modes are available in this very Session section). There is also the Notifications tab. This tab enables users to trailer their settings for alerts and notifications. These include security alerts as well as daily reminders informing the user of a VPN connection if there is one. Users who want to access options to enable or disable options such as Kill Switch and others should spend some time in this section. This is where they can turn on or off the encryption feature and disable/enable app crash reports. From an overall perspective, we think that the Speedify mobile app is pretty robust. It offers a good amount of customization for various users. But most of all, it isn’t overwhelming and very easy to use even for beginner VPN users. As alluded to at the top as well, Speedify offers users upwards of 1000 VPN servers that span over 30 countries. In terms of the number of countries, Speedify has a small VPN network. Although in terms of the number of VPN servers, it is pretty okay. Some VPN service providers such as NordVPN provider users upwards of 4000 VPN servers. On the other hand, ExpressVPN offers users VPN servers in more than 90 countries. Speedify concentrates most of its servers in North America, Asia, and Europe. It provides a few VPN servers in locations such as Oceania, Africa, and South America as well. Users have the option of selecting a VPN server based either on city or country. Those users who want to save time can just let the app do the work and allow it to connect to the fastest available server. Of course, Speedify also enables users to use P2P-friendly VPN servers. Our research shows that users should not face any problems while trying to connect to the internet via any Speedify VPN server. Speedify desktop client is very accomplished and can go toe to toe with some of the best desktop VPN clients available in the market right now. Our research also shows that users who only utilize a single internet connection will find that Speedify performs as well as any mid-range VPN service provider. Speedify connections are most reliable. We have also found out that Speedify makes the task of switching VPN servers fairly painless and short. Most of the time, users should expect to connect to the internet within a matter of seconds. The one good thing about Speedify is that it allows users to change VPN servers without having to disconnect from their current VPN server first. Granted, this is a small point. However, it does make a huge difference when it comes to quality of life. As far as the mobile app is concerned, our research shows that users can easily do things like combining an LTE connection with a WiFi connection to get better speeds. The best way to test any VPN service’s speed is via a speed test tool. Speedify provides one within the app so that users are able to see some rudimentary results. Our research shows that Speedify has no problems in doubling the speed of the connection of the both of the user’s connections are of the same speed when it comes to downloading. But it can’t do the same for uploading content. We can’t ignore the fact that the results from the company’s internal app cannot be considered as reliable as the results one gets from independent tools. However, there is little doubt that features such as channel bonding do have the ability to drastically improve the download speed of the user’s connection. As mentioned before, users should not expect as drastic an impact on their upload speeds. Now, let’s get to the very important question of how does a VPN service like Speedify stack up against some of the best in the business? In order to get fair results, one has to not only check for speed but check for speed that is verifiable via observation and measurement. For that to happen, one has to forget the fact that Speedify can combine internet connections. After that, one should test Speedify with a single internet connection and use other similar speed tests to come to a conclusion on how good it is when compared to other good VPN service providers. One way to test any VPN service for speed is to try and download some file of a fixed size from a given server. Then, one has to do that for other VPN service providers and one time with a machine that doesn’t have any VPN service running on it. One has to perform these tests for different servers based in popular locations such as the UK, US West, and US East. It is recommended to carry out such tests multiple times during the day to get the average. Again, one should never forget to run the control tests i.e the test on a machine that doesn’t have any VPN connection. Our research shows that Speedify can give the likes of StrongVPN Ivacy and ibVPN along with NordVPN a good run for their money when it comes to speed. As is the case with all VPN service providers, Speedify does decrease download speed. But it only does so marginally, which is a hallmark of a good VPN service. We have also found out that Speedify tends to offer more speed when users connect to a VPN server that is geographically close to their real location. This is also something that happens with all VPN service providers. Generally speaking, the further a VPN server is from a given location, the slower the speed it delivers. As far as Speedify is concerned, it managed to deliver decent speeds especially when we put it side by side with some of the other VPN services that we have mentioned above. How reliable are these speed results? We have mentioned on this site time and time again that speed tests are never definitive. They only serve the purpose of providing the user a general indication of how fast or slow a given VPN service is compared to an internet connection with no VPN and other VPN service providers. And that adds a huge factor of online randomness t one’s results. As always, users should make sure that they take our research on speed with a grain of salt. Usually, the performance of a VPN service would depend on the actual speed of the user’s internet connection. A user with a connection of 60 Mbps would experience shorter wait times for connection compared to a user with 30 Mbps internet connection. We are happy to report that Speedify tries its best to live up to the claims that it makes on its official website (at least when it comes to speed it does). Users can always take advantage of Speedify’s channel bonding feature in order to increase the speed of their internet connection by adding one extra internet connection on top of their default internet connection. Does Speedify Work With US Netflix? Speedify has the ability to unblock US Netflix. Our research shows that users should face no problems in connecting to US Netflix with any of Speedify’s US-based VPN servers. Speedify doesn’t just connect to US Netflix but it also does so seamlessly and does it every time. Experienced VPN users would know that the number of VPN services which can connect to US Netflix is dwindling by the day. So it is a refreshing sign that a VPN service like Speedify exists which has the ability to work with US Netflix. On the other hand, Netflix has shown no signs of stopping at blocking VPN services from enabling users to access its premium libraries from places other than the US itself. Apart from NordVPN, we don’t know of many VPN services that regularly work with US Netflix. Remember, the number of VPN servers that can allow access to Netflix libraries from other countries such as France and the UK. This is where even Speedify can’t deliver. Our research shows that Speedify can’t unblock Netflix France or UK Netflix. Users are free to test Speedify with other Netflix libraries as well. Our research showed mixed results. Just like Netflix, the BBC iPlayer service is also ratcheting up its mechanisms to block VPN connections. That is why it has become difficult for VPN services to provide access to BBC iPlayer outside UK. Our findings show that users will have a hard time accessing BBC iPlayer outside UK via the official desktop client. However, our research also showed that users should find success in accessing BBC iPlayer outside UK with Speedify iOS app. Speedify did not work with Amazon Prime Video through its US servers. Speedify did not work with China. The Great Firewall of China is just another area where VPN services are finding it very hard to live. There are some VPN service providers that work in China but Speedify isn’t one of them. If you ask the question of working with China to a Speedify representative, the representative would tell you that the company doesn’t have any plans on making their service work in China. As mentioned at the top as well, Speedify, as a VPN company, has its headquarters in Pennsylvania, USA. The USA is a member of the Five Eyes countries. For most privacy-conscious users, this is a red flag. Because governments in these countries subject their population to mass surveillance programs. What sort of logs do they keep, if any? If a VPN service doesn’t maintain any logs on its users then law enforcement agencies and other third parties won’t get anything from the VPN service provider. TL;DR: the company does not keep any logs on what its customers do, or which sites they visit via the Speedify VPN service. Generally speaking, this is sufficient to establish the company indeed does not record its customers’ traffic logs. that the user receives or sends via the Speedify VPN service. And these logs are the exact things that users need to watch out for when signing up for a VPN service. Connections logs can contain information about the IP addresses that the user may have used in the past. Third-parties can use this information to tie a given user with a given activity. Moreover, third-parties can use the same IP address to track activity and then trace it back to the customer. That statement mentions that Speedify does keep information on IP addresses. Though it does go on to mention that it keeps them no a temporary basis. The statement also indicates that the company records data related to timestamps and device identifier bits. Needless to say, this is confusing. Or perhaps misleading on part of Speedify. This does put question marks on the trustworthiness of Speedify as a VPN service provider. As far as encryption goes, Speedify does a good job of implementing a strong one. Our research shows that if the user’s hardware has complete support for AES, then Speedify will implement 128-bit AES encryption. Otherwise, Speedify implements the encryption that the community now knows as ChaCha 256-bit. Both of these encryption implementations come with security features such as perfect forward secrecy. Speedify app comes with advanced built-in security features such as DNS leak protection and Kill Switch. But users have to keep in mind that Speedify disables these features by default. Our research shows that for some reason even if the user does not enable DNS leak protection, Speedify still somehow protects against DNS leaks. Currently, Speedify makes use of Google DNS servers. This isn’t the best situation as far as user privacy is concerned. Some of the top VPN service providers operate DNS servers that they themselves own and are private. As mentioned just now, Speedify app comes with some advanced security features. One of those features is Kill Switch. The Kill Switch feature is able to halt all user internet traffic whenever it detects that the user’s VPN connection has dropped for one reason or another. Speedify disables this advanced security feature by default as well. However, users can easily go the Privacy tab of their app and enable both the Kill Switch and DNS leak protection features within the Settings menu. VPN services don’t always play nice when it comes to working right out of the “box”. That’s why most of them have customer support departments. Users who need any sort of help from Speedify when they are setting up or using the Speedify app, can search the internet because Speedify doesn’t give a lot of options. Moreover, users will also have to show a bit of patience because Speedify will take its sweet time in responding to queries. The first way in which Speedify tries to help users in need is via its online knowledgebase section. Our research shows that the knowledgebase section is fairly exhaustive. It has lots of setup guides for users to read. Apart from that though, it is pretty much dry. Users who fail to get any sort of help from the knowledgebase section can submit a ticket. That’s right, Speedify doesn’t offer any live chat feature. During our fact-finding mission, we found out that even if the user asks some general VPN questions related to privacy and security, Speedify gives them an automatic first response. The first response is a statement which tells the user specifics about Speedify’s business hours and how if the user has asked his/her question during that time, the company would respond to it. If this is the amount of time Speedify representatives take for general questions, then they are likely to take even longer for troubleshooting issues. In any case, such response times are atrociously low. Speedify can respond is as less as two days time at its fastest. But that is far from ideal as well. For users who are looking for strong security features, good compatibility with various streaming services and fast speeds, Speedify could represent a decent option. However, users should keep in mind that the channel bonding feature works in such a way that it can quickly eat up the user’s allotted monthly data without much notice. Of course, the VPN itself provides unlimited bandwidth along with P2P-enabled VPN servers. Combine that with fast speeds and one is bound to think that Speedify is one of the best VPN service providers for torrenters. Because Speedify keeps IP address logs. This alone makes Speedify a VPN service that torrenters should stay away from if they value their privacy. On the customer support front, Speedify is limited as well as slow. Users can’t get in touch with the company via a live chat feature. New VPN users will find it extremely hard to get help when needed. That is why we recommend that beginner users should try for some other more user-friendly VPN services. Another point that we would like to mention here is that even though Speedify works with US Netflix, it doesn’t work in countries such as China. As far as best value for money VPN is concerned, IPVanish is still the king. Click here to read our full IPVanish review right here and right now.